Bianchi Memorials is pleased to be a full-service memorial and granite specialty company, providing customers with a wide range of services including customized monuments, bird baths, Japanese lanterns, granite benches, pet monuments and granite countertops, among others. For more than 20 years, we’ve prided ourselves on friendly, reliable and affordable services. Granite is a beautiful material that’s unparalleled in its allure and brilliance, and it can be shaped and worked into a wide variety of luxurious products. At Bianchi Memorials, granite is our material of choice! We’re proud to shape this exceptional material into a wide range of custom memorials, among other products, and for the last 20 years, we’ve made a name for ourselves as the premier provider of superior workmanship and craft. Our granite memorials are revered for their quality, design aesthetic and originality, and our experienced professionals work closely with clients to make sure our creations match your vision. We have a range of granite samples available to view on–site! We serve the entire State of Vermont, as well as bordering states. Our prices are competitive and our workmanship is superior. We’re happy to provide free quotes to all prospective customers. 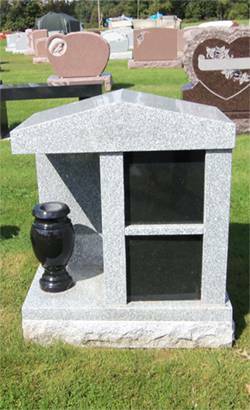 We offer the best in custom granite memorials and products to all of Vermont and the bordering states.